I first started drawing about fifteen years ago when I decided to get clean, as I found I had a lot more time on my hands. At first I just copied pictures I liked – fairies, dragons and Celtic patterns. I soon got bored with this but found it quite frustrating to move on to trying different themes as I’d had no formal training or any idea about how to compose the drawings I wanted to do. I had a girlfriend who was a very accomplished painter and she would get very frustrated with me as I refused to go to any drawing lessons. When I came to jail I had a chance to take some art classes. They brought in a TAFE teacher and I seemed to soak up everything she taught. I learnt about perspective, how light works, composition – it all just clicked. I found myself doing a lot of art that came from a dark space in my mind. In one way I feel it was a way of letting go, and on the other it was a way to express my grief and re-visit it. What I did notice was I enjoyed doing birthday and Christmas cards and pictures for other inmates’ children and family. This helped me to see the gift of joy I could bring to others. I feel the turning point in my art was when I first started to look at the works of Salvador Dali. I was in awe of his work and how he went about and created the pieces of art he has produced – an endless continuing story open for all sorts of interpretation, which has impacted the way I draw and how I put together a piece. 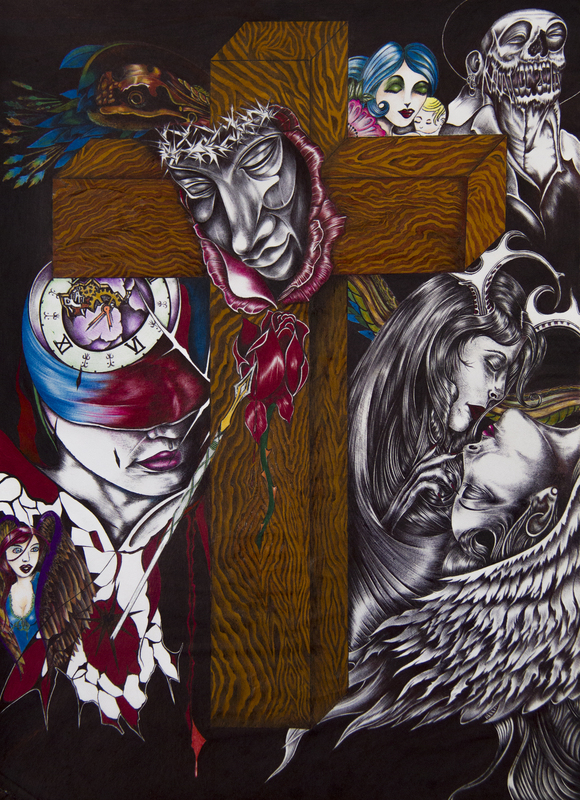 When the chaplain first supported me to enter the Prison Fellowship Art from Inside competition, I wasn’t that interested for fear I wasn’t good enough. After a while I found I couldn’t hide behind my shortcomings any more. The theme I used was based on portraying God’s love for us through the forgiveness of Christ’s act. So I bounced a lot of ideas I had off another brother in Christ (inmate) whom I would like to thank. I hope that I have honoured God in my work as I have been honoured by his Will through all the support and encouragement I have received from others. This journey would not have been possible on my own. Never too late. God bless you all. The ultimate expression and fulfilment of God’s unfailing love for us is revealed in the cross. The death of Jesus once and for all deals with our sinfulness and restores us to relationship with God, a relationship from which He never withdraws. “Forgiveness” encapsulates the elements of Romans 8:38-39. “neither death nor life” seen in the top right hand corner – a mother and her new born baby, with an image of death next to her. ”neither angels nor demons” seen in the bottom right. “neither the present nor the future” The broken clock represents time – past and present, whilst the blindfold represents the unknown future. “nor any powers” Lurking in the background is the serpent, and he weaves through the earth tempting mankind and trying to separate us from God. “neither height nor depth, not anything else in all creation” with the angel looking over on the bottom right. “will be able to separate us from the love of God that is in Christ Jesus our lord.” In Jesus we see the ultimate expression and fulfilment of the love of God for mankind. Jesus was falsely accused, mocked, flogged, humiliated and with a crown of thorns pressed on his head, nailed to a cross. His body pierced, his blood flowed – for our transgressions. His death brings us forgiveness and an inseparable bond with the Father.